This timepiece from the Jarrow collection features a honeycomb texture dial that echoes the industrial feel of motorcycle radiator grills. 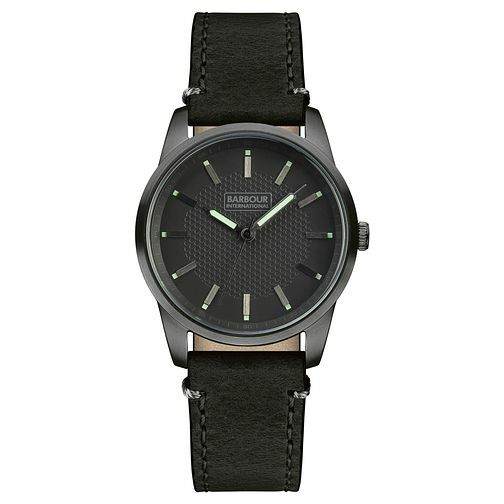 This casual Unisex watch comes in a brushed gunmetal stainless steel case and is set upon a thick black leather strap. Luminous hands and hour markers have also been included for added functionality. Barbour Jarrow Men's Gunmetal Ion Plated Leather Strap Watch is rated 5.0 out of 5 by 1. Rated 5 out of 5 by Anonymous from Very good value Bought this watch as a gift, it arrived promptly in a beautifully presented box with instructions included. Greatly received by the recipient and it looks good on!! Would have bought it full price, the discount was bonus!